Deontay Wilder will defend his WBC World Heavyweight championship belt against Alexander Povetkin in what will be a massive fight set to take place in MEGASPORT ARENA in Moscow, Russia on Saturday, 21st May 2016. This is the only second time in his professional career that Wilder is traveling outside of USA for a fight. Povetkin has won four back to back fights since his disappointing defeat against Wladimir Klitschko. Part of the reason Deontay Wilder accepted the challenge to fight Povetkin in Russia is the massive purse offered ($4.5 million). Povetkin promoter Andrey Ryabinsky made a massive $7.15 million purse bid in order to lure Deontay Wilder for a fight and since Wilder is WBC champion he was entitled to ask for bigger chunk of the purse and both parties agreed at $4.5 million guaranteed for Wilder while 10% ($715,000) of the total purse will be awarded to the winner which means Wilder can clear around $5.3 million if he successfully defend his titles. The fight will be shown live on Showtime Sports as non-ppv event while BoxNation has won the rights in the UK. It is a good business fight but maybe not a good decision to fight in Russia where dodgy scoring might cost Wilder if the fight goes full length. Deontay Wilder will have to knockout Povetkin to make sure he won’t be denied. 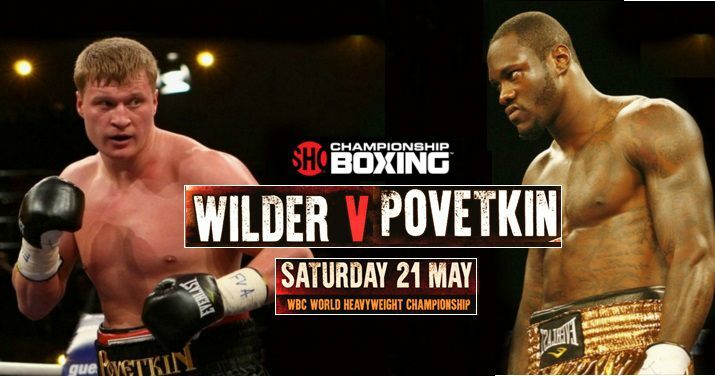 Having said that, Povetkin is no pushover and will be the biggest challenge so far Wilder has faced. Russian is coming into this fight on the back of a four straight wins after his only loss of the career against Wladimir Klitschko. The winner of this fight is likely to face winner of Tyson Fury vs Wladimir Klitschko or even a fight against Anthony Joshua’s early next year. Its all happening in the heavyweight division with some massive fights lined up in year and half.